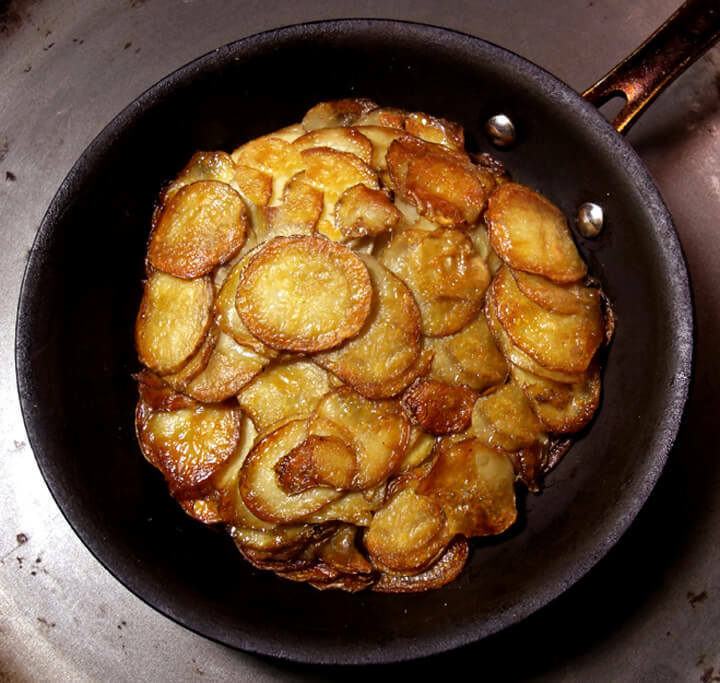 A different version of what most of us know as scalloped potatoes, this simple recipe is also known as a potato cake for obvious reasons. Most recipes will instruct you to peel the potatoes, but I don’t find this necessary, justifying my lassitude by claiming it makes for a prettier presentation. The only trick to preparation is turning the cake to brown both sides. I’m certain that there are people in the world who have the manual dexterity to flip the cake with a flick of the wrist, but a pound of potatoes is a hell of a lot heavier than an omelette, so I’ve yet to master this technique, instead placeing a lightly oiled plate over the pan, fliping it and and sliding the cake (with exceeding grace and beauty) back into the pan to brown evenly. Slice small red potatoes very thinly (having a mandolin comes in handy here, and you can find a simple one for a dozen dollars or so) and, working quickly before the potatoes discolor, arrange in layers—sprinkling with salt and pepper—in a small sauté pan with plenty of oil or melted butter. Place in a hot oven—400—until bubbling and lightly browned. Flip or turn in the method described earlier to brown evenly. Serve hot with a hard grated cheese or cold with sour cream. Pugnacious people would add rosemary, but I find it annoying. I too fine rosemary annoying.